The Sonoma County Terroir includes seventeen AVAs (American Viticultural Area) which define the diversity of this renowned wine region and exhibit a far greater variety of wine styles and grapes than you will find in most other premium wine areas. From the highly regarded Chardonnay and Pinot Noir of the Russian River Valley and Sonoma Coast, to the dense flavorful Zinfandel of Dry Creek Valley and distinctive, approachable Cabernet Sauvignon of Alexander Valley and Sonoma Valley, Sonoma County’s range of geography—valleys to mountains, coastal ranges to inland benchlands—is second to none. The size and distance between these distinctive AVAs ensures individualism of wines, viticultural approaches and myriad philosophies of winemaking. 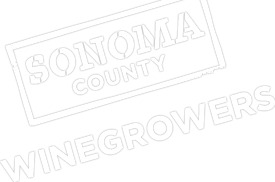 Sonoma County offers an almost unlimited range of microclimates and growing conditions within its 17 AVAs. This is unparalleled among the world’s premium winegrowing regions. Sonoma County is blessed with an ideal long growing season, with sunny days and almost no rain from May through September. Summer average high temperatures range from the 70s to the low 90s – ideal for ripening grapes – but even the warmer inland regions of Alexander Valley and Knights Valley, cool evening temperatures in the 40s and low 50s preserve the grapes’ acidity and balance. The Pacific Ocean provides a cooling maritime influence, bringing cool air through the Petaluma Gap, Russian River, and San Pablo Bay entry points that cool the western and southern regions of Sonoma County. The daily summer fog patterns are ideal for cool climate varieties. It has been said that Sonoma County has more soil types than in all of France. The region’s dramatic geological history has resulted in 11 major formation types, 31 different soil series within those types, and innumerable permutations within each series. Sonoma County’s vineyards range from sea level to 2,600 feet above sea level. The array of valley, benchland, and mountain elevations and slopes heavily influences soils fertility and grape ripening times; adding yet another variable for grapegrowers as they match the right variety and rootstock to each vineyard blocks unique growing condition. Alexander Valley, almost as warm as Knights Valley, the valley floor of Alexander Valley has gravelly soil that produces some of the county’s richest Cabernet Sauvignon, along with flavorful, ripe Chardonnay. The Valley’s hillsides produce complex and concentrated Zinfandel, Merlot, and Cabernet Sauvignon. Merlot shines in Bennett Valley like nowhere else, with volcanic-laced, clayey soils and a moderately cool climate that results in extended hang time ideal for the varietal. The long growing season helps maximize flavors and increase concentration, while the cooler temperatures preserve the grape’s natural acidity. One of the world’s premier winegrowing regions, Los Carneros – “The Ram” in Spanish – is located less than 40 minutes from San Francisco, Marin County, the East and North Bays. Sacramento and the South Bay are both just a short distance further. A cool climate appellation, Carneros has long been known for its unassailable Chardonnays, elegant Pinot Noirs and its sparkling wines. In recent years, Carneros has been recognized for the quality of its Syrah, its Merlot and new varietals now emerging throughout the appellation. As inland temperatures rise during the day, moist air over the cold Pacific is drawn inland over Carneros, cooling temperatures from mid afternoon into evening. These fresh afternoon winds slow activity in leaves, stressing the vines even when irrigated. Fog rolls in throughout the night and this provides a gentle buffer to the next morning’s sun, repeating the climatic cycle. Carneros was the first wine region based on climate rather than political boundaries. It received its designation in 1983. Carneros soils tend to be dense, shallow (approximately three feet deep), high in clay content, and of low to moderate fertility. These soils impact the vine’s vigor by restricting development of the root system, providing just enough nutrients and water to sustain growth without excess development. Subsoils also vary in Carneros. Each of the different subsoils substantially changes the environment of a grapevine’s roots, and affect the composition of the fruit. Thus it is no surprise to find diversity in Carneros wines. Soil, climate and elevation all separate Chalk Hill from other parts of Sonoma’s Russian River Valley. Occupying the northeast corner of the larger Russian River AVA, Chalk Hill is named for its unique, volcanically-derived, chalky white ash soils. These mildly fertile soils lend themselves to the production of excellent whites, particularly Chardonnay and Sauvignon Blanc. Chalk Hill’s five wineries sit above the rest of the valley, on the western benchland slopes of the Mayacamas Mountains, separating Sonoma from Napa. The appellation enjoys a warmer climate relative to the rest of the Russian River Valley. Due to the higher elevation of this viticultural area, vineyards escape much of the cooling fog that regularly shrouds the lower-lying growing areas near the river. Approximately 16 miles long and 2 miles wide, Dry Creek Valley is one of the smallest enclosed American Viticultural Areas. Roughly 9,300 acres of vineyards extend along the valley floor, the surrounding benchlands and hillsides, and 58 wineries produce a diverse selection of wines ranging from the renowned Zinfandels to Bordeaux and Mediterranean varietals. The history of grape growing and winemaking in Dry Creek Valley is among the longest in California, with its roots beginning more than 130 years ago. Morning fog from the Pacific Ocean tempers warm days – good balance of maritime and inland climates. The stone-strewn soils are ideal for concentrating fruit and flavor character of Zinfandel, the hallmark of Dry Creek Valley, along with Cabernet Sauvignon, and the resulting wines are rock solid examples of their types. Fort Ross-Seaview American viticultural area is located in the western part of Sonoma County, California contains 18 commercial vineyards, lies close to the Pacific Ocean and is about 65 miles north-northwest of San Francisco. It lies entirely within the Sonoma Coast viticultural area and does not overlap, or otherwise affect, any other viticultural areas. Vineyards within this area are generally located on rounded ridges with summits extending above 1,200 feet consisting of steep, mountainous terrain made up of canyons, narrow valleys, ridges, and 800- to 1,800-foot peaks. Areas above 900 feet in elevation, the climate is influenced by longer periods of sunlight and is warmer than that in the surrounding land below. Fountaingrove District is located in a section of eastern Sonoma County that is comprised of 500 hillside acres owned by small growers. Home to five wineries and at least 35 vineyards, the new AVA is noted for its Bordeaux varietals such as cabernet sauvignon, merlot and cabernet franc as well as syrah and zinfandel. The area is surrounded by Sonoma Valley and Bennett Valley to the south, Knights Valley and Chalk Hill to the north, and the Russian River Valley to the west. The most remarkable feature of the new district is its elevation, up to more than 2,000 feet in some places, as well as a marine influence because of a gap in the Sonoma Mountains in Santa Rosa, resulting in a cooler climate than nearby areas. The fog is Green Valley’s trademark. The predominant soil type (60%) of this American Viticultural Area (AVA) is Goldridge soil, the most sought-after type in Sonoma County – especially for Pinot Noir. Knights Valley, the most remote of Sonoma County’s appellations, snuggles up against Mt. St. Helena, the area’s most influential feature. The unique character of this appellation can be discovered in its mountain vineyards, where ideal growing conditions have resulted in cabernet sauvignon of regal quality. The new “Moon Mountain District of Sonoma County” lies east of Highway 12 and spans 17,663 acres, which includes 1,500 acres of commercial vineyards planted at elevations from 400 to 2,200 feet. The new appellation is located within the Sonoma Valley AVA, but the Moon Mountain vintners and growers have long wanted to distinguish their high elevation wines on the labels. For full details, visit: www.regulations.gov and search for Moon Mountain. The area seems as vast and amorphous as its name, encompassing Chalk Hill, Knights Valley, Alexander Valley, Dry Creek Valley, Russian River Valley, and most of Green Valley within its embrace. The border follows Bohemian Highway in Monte Rio southeast along Dutch Bill Creek through Camp Meeker, Occidental, and Freestone, stretches along Highway 12 through Sebastopol to Fulton Road, turns north to River Road and from there traverses Mark West Springs Road to the Sonoma–Napa border. Its north boundaries are formed by the county lines of Lake and Mendocino. 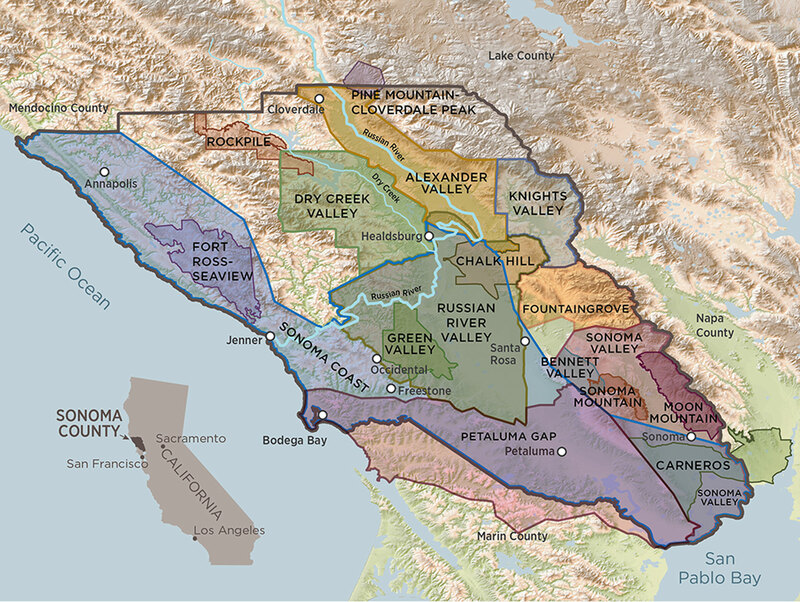 The viticultural area is totally within the multi-county North Coast viticultural area and overlaps the northernmost portions of the Alexander Valley viticultural area and the Northern Sonoma viticultural area. The area currently has 230 acres of commercial vineyards, with another 150 acres under development. The distinguishing features of the viticultural area include its mountainous soils, steep topography with high elevations, and a growing season climate that contrasts with the climate of the Alexander Valley floor below. Also, the vineyards within the viticultural area generally are small (5-20 acre plots of flat or gently sloping ground). Spreading west of Lake Sonoma to the Mendocino County border, Rockpile is known for intensely-flavored red grape varietals with great concentration and balance. At elevations up to 1,900 feet, Rockpile is too far upland for the penetrating fogs that influence other Sonoma appellations. This exposes grapes to more California warmth and sunshine, boosting their ripeness and richness. The appellation is designated by altitude and geography. The Sonoma Coast AVA extends from San Pablo Bay to the border with Mendocino County. The appellation is known for its cool climate and high rainfall relative to other parts of Sonoma County. Close to the Pacific, with more than twice the annual rainfall of its inland neighbors, it can still be warm enough to ripen wine grapes because most vineyards are above the fog line. Pinot Noir and Chardonnay shine, along with cool-climate Syrah. The 2,400-foot Sonoma Mountain range begins to rise above the town of Glen Ellen at the western edge of the Valley of the Moon. Found here are high-altitude, steep-sloped vineyards, with eastern exposures to catch the fog-free morning sun. These vineyards fall within the larger Sonoma Valley AVA. However, due to the unique hillside terroir, they are entitled to use the more specific designation of the Sonoma Mountain AVA. Powerful, yet elegant Cabernet Sauvignons – the appellation’s specialty – grow here on well-drained soils. The irregular folds and crevices of the mountain slopes also create microclimates suitable for limited production of a diverse range of other varieties, including Chardonnay, Sauvignon Blanc, Semillon, as well as Pinot Noir and Zinfandel.